Treats, chew toys, rawhide bones: what should we really be concerned about? There are many types of treats that are safe and good for pets. The most important thing to remember about treats: whether they come in the form of human food or specific dog made treats: they should not make up more than ten percent of the calories in the diet. The most common concern over treats in the last decade is jerky type treats. These types of treats have been known to cause illness and even death in dogs. There are still numerous ongoing studies as to what causes this problem. The FDA and associated laboratories have tested a wide array of treats for bacteria, heavy metals, pesticides, antibiotics, and many other harmful substances. They have found no specific cause. The safest way to avoid this problem is not to purchase jerky type treats. However, if your pet eats these treats, close monitoring can make a big difference. The FDA advises that if within hours to days of feeding jerky treat products to your dog you notice signs of decreased appetite, decreased activity, vomiting, diarrhea, increased water consumption and/or increased urination, you should alert a veterinarian as soon as possible. There are a wide variety of safe chew toys for all different types of dogs. Chew toys should be selected based on the personality of each pet. Some dogs will destroy and consume any toy they come into contact with, while other dogs are more selective. Dogs that like to destroy their toys should be given toys made from materials that are difficult to break down, such as firm rubber, and plastics. These dogs should also be closely monitored to ensure they aren’t ingesting their toys when they are ripped apart. Dogs that are more selective about what they destroy and eat should have toys tailored to their personality. Some dogs prefer soft toys but tend to eat “squeakers” and stuffing out of them. 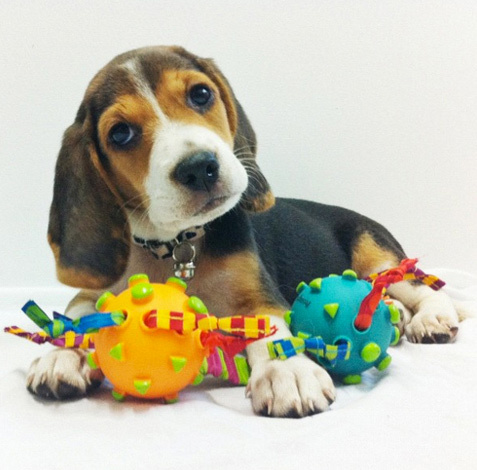 There are soft toys available without squeakers or stuffing in them that can be safely chewed. Another important note about chew toys is dogs should not be allowed to chew on tennis balls or toys made out of tennis ball material. The material on the outside of these balls is designed to withstand repeated contact with rough surfaces and therefore wears down the enamel on dogs teeth. 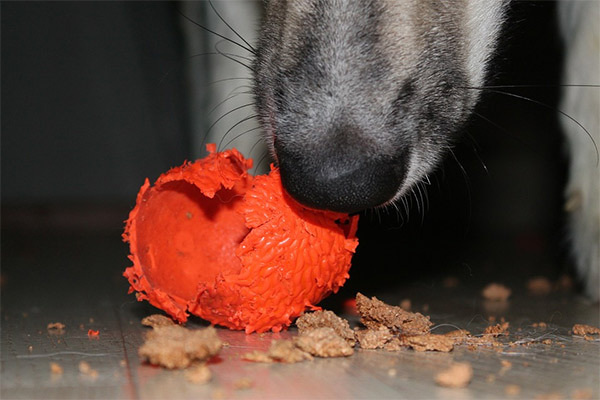 While it is safe for dogs to play with tennis balls and other balls, they should not be allowed to chew on them. Similar to chew toys, rawhide bones come in many shapes and sizes. The particular shape and size that is safe for each dog should be tailored to their needs. Rawhide chews should be significantly bigger than a particular dog's mouth so they cannot swallow it whole. Rawhide bones should only be given to a pet with supervision. This is because when these chews are wet they become malleable, which allows dogs to swallow them where they can get stuck in the back of the mouth or throat. When rawhide chews become small enough that they can be swallowed whole they are no longer safe. A common misconception about dogs is that if they have a dry nose they are ill. This is not correct. Dogs may have dry noses for many reasons and some of them may be medically relevant. Dogs that become dehydrated may have a dry nose but will show more reliable signs of this such as poor skin turgor (skin tenting) or tacky gums. Dogs also tend to lick their nose to keep it moist. Not every dog does this behavior which may lead them to have a drier nose. Dry noses should not be used as a reliable indicator of illness.